If you are looking for a dog tag pendant that is the perfect choice to engrave then our tungsten carbide diamond dog tag pendant with bead chain is just what you want. 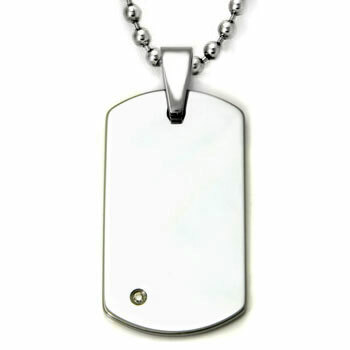 Made from high polish tungsten the dog tag shines so very bright it will be seen for miles. The pendant is measured to be 1 and 3/4 inches long by an inch wide, it features a 0.01 Total Carat Weight round brilliant diamond color G/H and clarity SI1. We feel our tungsten carbide diamond dog tag pendant with bead chain is perfect for both men and women so that anyone can purchase it with self confidence. Additionally as with all of our wedding rings and jewelry the dog tag pendant is backed by our 100% lifetime warranty, which is unique as well within the jewelry industry. Be sure to shop our entire line of tungsten, titanium, and cobalt chrome wedding bands and jewelry. Item looks amazing! !After a week of wearing,no allergic reaction!! High quality tungsten! !